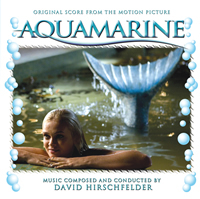 Presenting the score to the 20th Century Fox feature film AQUAMARINE, starring Emma Roberts (Nancy Drew) and Sara Paxton. Acclaimed composer David Hirschfelder (Shine, Strictly Ballroom, Sliding Doors) buoys all the charm and wonder of this heartwarming fantasy with a delightful, sumptuous orchestral score expertly performed by the The Sydney Orchestra. Liner notes include comments from the director. This is a Limited Edition of 1000 Units.